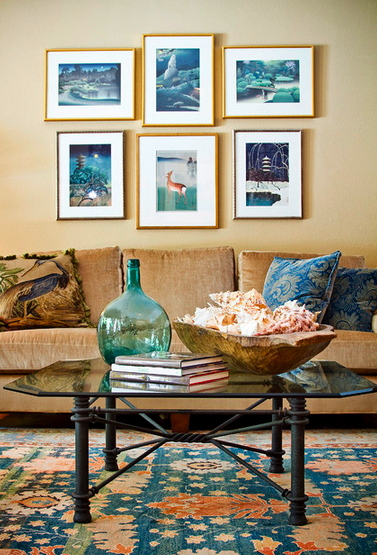 Photo via Houzz user SFGirlbybay. 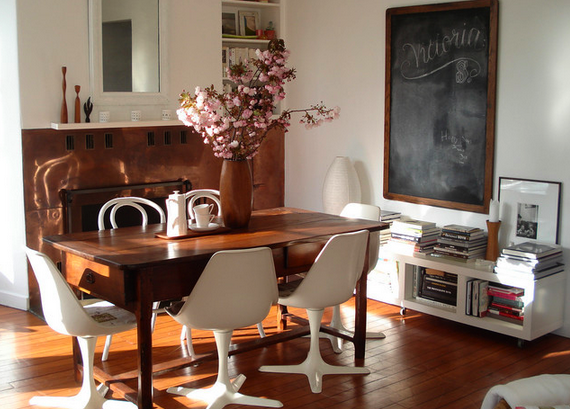 An old farm table and copper fireplace are paired with modern chairs, a chalkboard, and clean, fresh white for an eclectic look. An Ikea shelving unit was outfitted with castors and turned on its side to create a low bookcase. 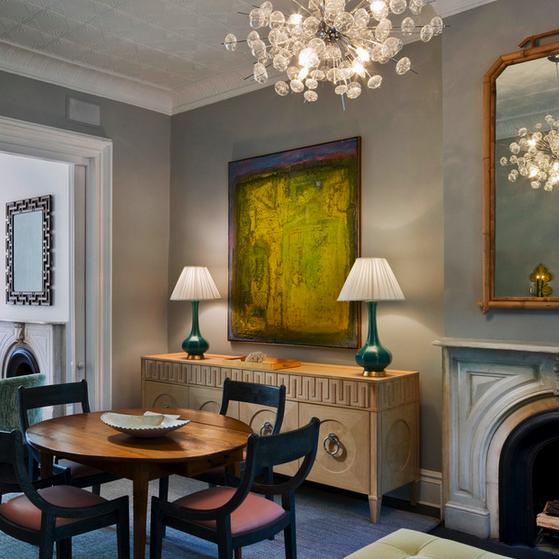 This sophisticated space incorporates the owner’s existing vintage table. New pieces, such as the sideboard, rug, and light fixture were added for an entirely new aesthetic. 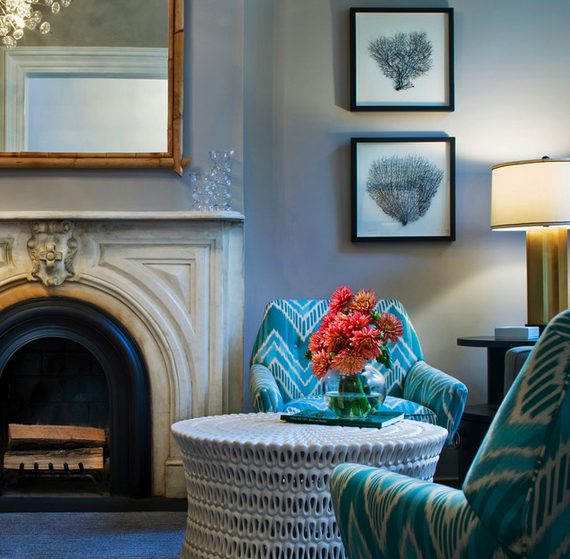 Photo via Drew McGukin Interiors. 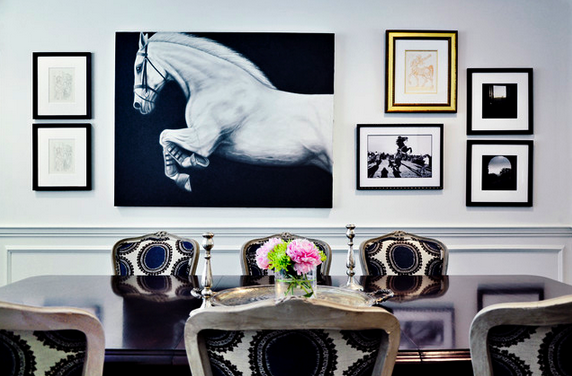 The horse painting, already owned by the clients, served as the inspiration piece. New elements play off the drama of the artwork. 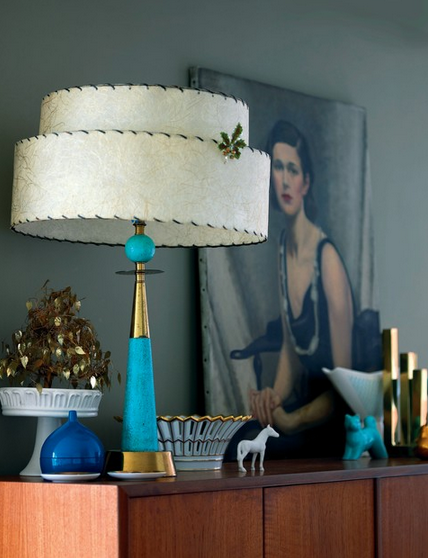 Photo via Allison Jaffe Interior Design. The client had been collecting the vintage artwork that graces the walls for years and the coffee table was already in the home as well. A coat of paint, funky pillows, accessories, a rug from the 1960’s, and a new couch with plush fabric tie the space together. Photo via Elad Gonen & Zeev Beech. Project for Turkiz by architect Nina Doctor. An old dresser was given a makeover. The designer added glass cabinets and an orange sink to create a one-of-a-kind vanity. 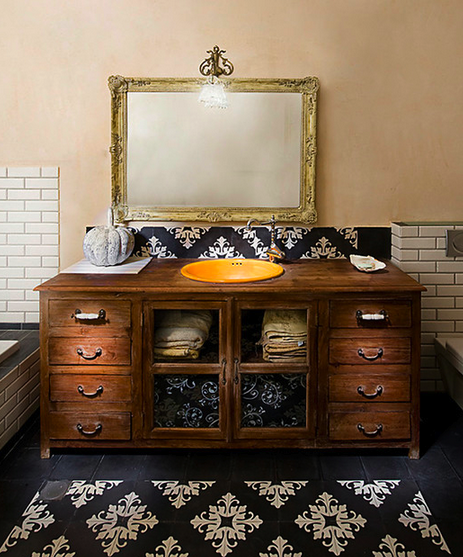 The unique floor tiles with matching backsplash, blush walls, subway tiles, and an antique mirror create an elegant, vintage feel. If you can’t live without your chairs, have them reupholstered. These chairs were the clients and instead of opting for new ones, they were updated with textured fabric. 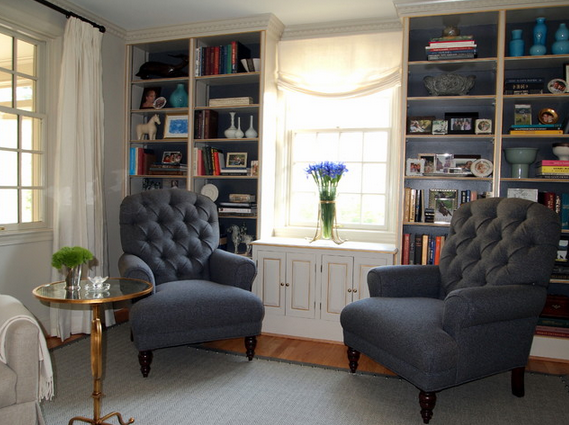 The painted bookshelves, eclectic knickknacks, and neutral walls are perfect for a traditional space. Mixing old and new can really make a space pop. The framed sea ferns were from the client’s own collection. The vintage chairs were covered in bright, bold fabric A few updates took the room from traditional to contemporary. Via Andrea Schumacher. Photography by Emily Minton Redfield. The cat seems right at home in this mix of global and vintage. 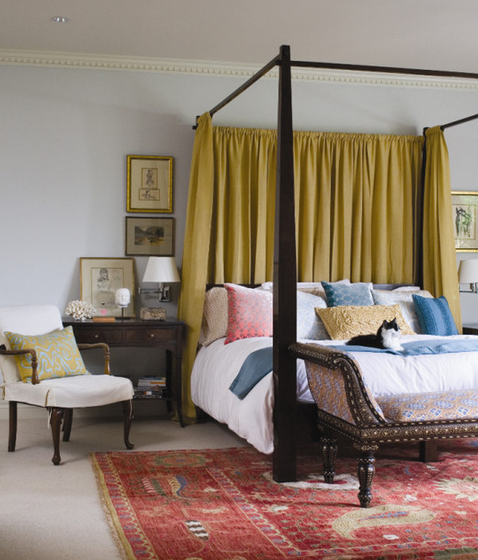 The homeowner’s existing four poster bed was adorned with fabric and used as the centerpiece. Well chosen antiques, contemporary bedding, and an oriental rug make for a soothing bedtime retreat. 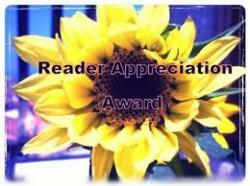 Emily Chalmers via Ryland Peters & Smalls | CICO Books. The old wooden table serves as a fun, rustic twist, especially when paired with contrasting white chairs. The modern appliances, covered barstools, large island, and pendant lights shine in the sunny kitchen. Via Loren Julia St. Andre’. When designing a room for a child, tween, or teen, it’s important to mix in playful elements that suit their style with timeless pieces they can grow into. Add interest with accessories, fabric, and paint. This way, making alterations to adapt to their ever changing preferences will be affordable and simple. The vintage chair is upholstered in a tween-friendly fabric and the bright, cheerful color scheme ensures that the room is age-appropriate. Pieces, such as the desk, will last for years. The open floor plan of this home creates a light, airy feeling. Contemporary touches, such as bold accents, and butterscotch and green walls, are tempered by the client’s existing dining room furniture and rich brown in the entryway and dining room. Substantial columns serve to create distinct spaces. While the home is new, the dark wood family table adds warmth and exhibits the homeowner’s personality. Via Jason Ball Interiors, LLC. While remodeling a home from the 1930’s, the designer wanted to retain a sense of the era, yet ensure that it was perfect for a young couple. Working with the existing, vintage dining table, Ball added texture to the wall with Moroccan-style wallpaper that complements the colorful chairs and mismatched host and hostess chairs. The vintage chandelier and gold wall decor infuse the room with a little glam. 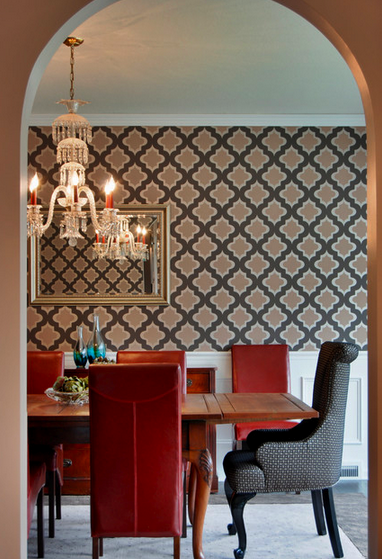 The result is a traditional, yet edgy, dining room. Via Iris Interiors LLC (me). The client’s antique French cupboard takes center stage. The table was crafted from reclaimed wood and new dining chairs were added to create this old world sensibility. 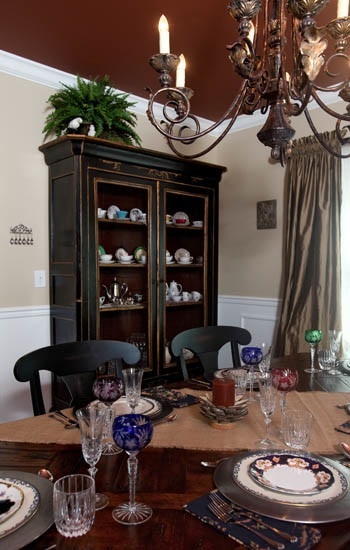 The eclectic dining room was completed with luxe window treatments, a rustic chandelier, and heirloom china. The painted ceiling further creates drama without taking away from the history-soaked ambiance. Do you have items that absolutely must stay? How do you work them into the room when you change decor? Categories: Go Green, Interior Design & Decorating | Tags: antique, decorating, design, family treasure, mix old and new, preserve history, recycle, redesign, repurpose, upcycle, vintage | Permalink.